Music has the power to move us – and to get us moving better. Here’s how your playlist can help you recharge your workout. They say music has the power to move us. Our favourite songs can elicit fond memories, taking us back to our favourite place, people, or moment in our lives. But it’s not all just tempo and loudness. In 2009, The Sport Psychologist journal published a finding that showed tennis players recorded faster reaction times when they listened to songs with emotionally-charged lyrics, as opposed to music with just fast tempo and no lyrics. If there’s any doubt as to the effectiveness of music when exercising, consider this: 11 years ago, America’s governing body for distance racing, USA Track & Field, banned the use of personal music players to “prevent runners from having a competitive edge.” Gives new meaning to the term dope beats. What should you listen to when working out? Different music elicits different responses in people. 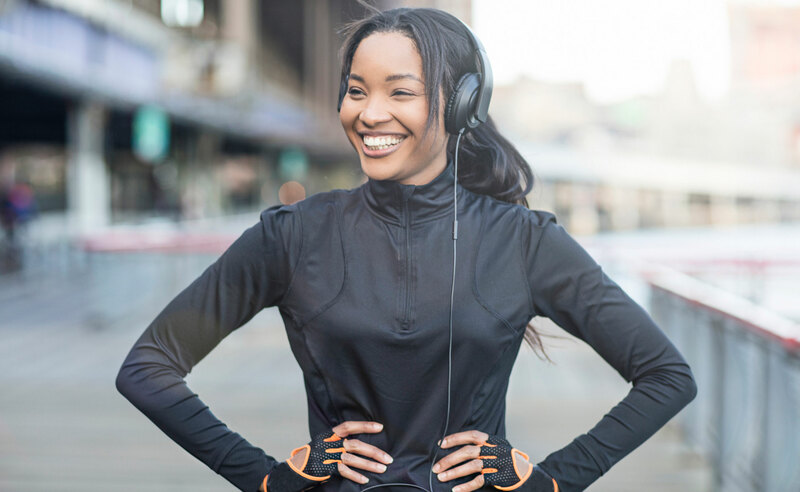 Though we all have our individual preferences as to what gets us moving, music with a steady tempo and clearly-defined beats are generally the way to go for a good workout. For warming up: Choose songs with a tempo around 100-120 BPM, but be mindful not to choose tracks that are going to put you to sleep! For weight training: A slightly up, yet steady tempo of around 130-140 BPM is ideal. Too fast and you may be fighting your inner metronome and risk losing form during your lifts. For cardio activities: Depending on the length and intensity of your workout, 145-160 BPM is a good starting point. Personal preference and running rhythm will also play a role in what music works best for you. For cooling down: Now’s the time to reduce your heart rate and bring down the intensity. Relaxing tunes around 100-120 BPM will allow you to catch your breath and get you in the right frame of mind for that well-earned stretch. You won’t have to look hard online to find plenty of music apps that can automatically play tracks based on your running tempo, or that let you set the tempo, or type of music you want during your session. And finally, before you go out there and smash your PBs to Thunderstruck, be sure to play your workout tunes at moderate levels to prevent any potential hearing damage. And being ‘in the zone’ is great, so long as you’re fully aware of surrounding obstacles, pedestrians and traffic!